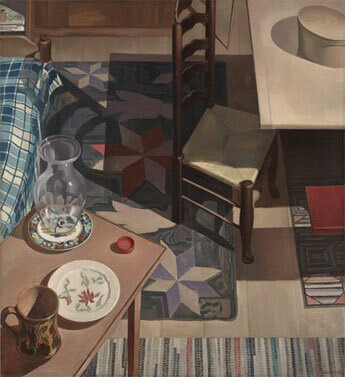 Modern American Charles Sheeler was born in Philadelphia and studied in the School of Industrial Art and the Pennsylvania Academy of Fine Art in Philadelphia. 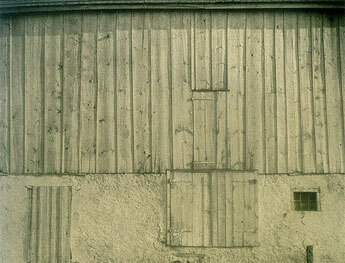 Although he supported himself at that time as an architectural photographer, he dabbled in painting on weekends. During the 1920s, Sheeler was associated with a group of painters called the Precisionists, known for their realistic style of painting. He focused strongly on industrial subjects and was a distinguished photographer of machines. 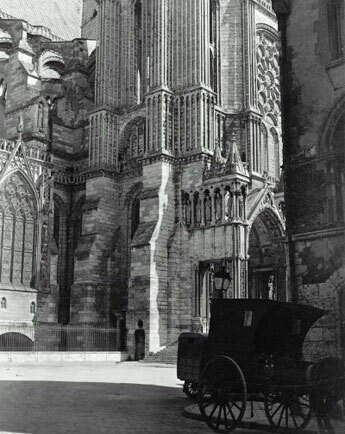 He perfected a method of achieving a photographic quality with paint. Even when he painted in an abstract style he was still concerned with achieving absolute accuracy and exactness in his art. 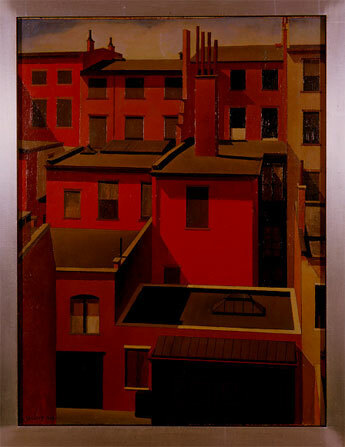 The work of American painter Charles Sheeler is, in its pragmatic association with the American scene and its consistently lucid technique, central to the precisionist style. 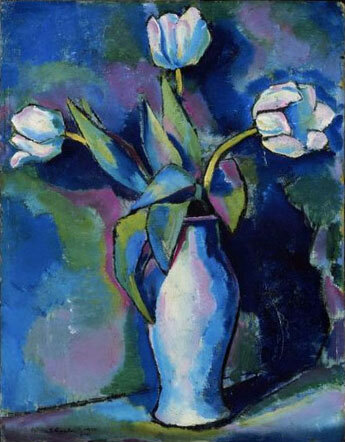 His techniques varied from photographic realism to modified abstraction. Charles Sheeler’s photographs and paintings of urban and industrial scenes revealed his interest in the formal vocabulary of Cubism. 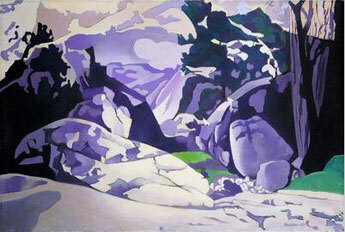 He worked for “advertising agencies (particularly for Ford plants) and collaborated with fashion magazines, while his painting developed into an increasingly “immaculate” rendering (www.bookrags.com). After 1932, he gave up photography, using it solely as a model thereafter. His paintings and drawings “are characterized by a formal simplification, an impersonal style, and a precision of the brushstroke, somewhat close to Demuth” (Lucic 21). 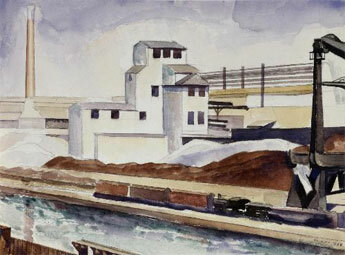 Sheeler described the heartland of America, without falling victim to regionalist isolation. His paintings of factories, Pennsylvania farms, and Shaker furniture reflected his desire to glorify a kind of progress specific to America, where mechanical progress followed tradition. 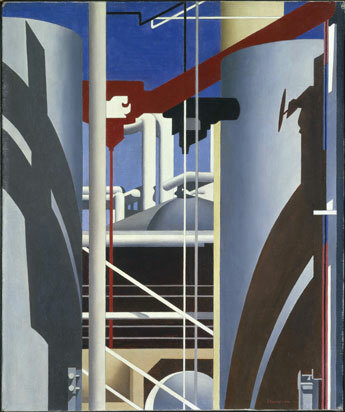 In 1938, Charles Sheeler was commissioned by Fortune magazine to produce six paintings extolling America’s industrial power. 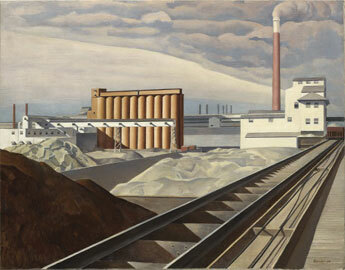 Sheeler visited power stations across the nation, photographing selected sites which became the basis for the paintings.’ These paintings, known collectively as Power, were reproduced in a “portfolio supplement to the December, 1940, issue of Fortune and exhibited from December 2 to December 21, 1940 at Edith Halpert’s Downtown Gallery” (Lucic 20). 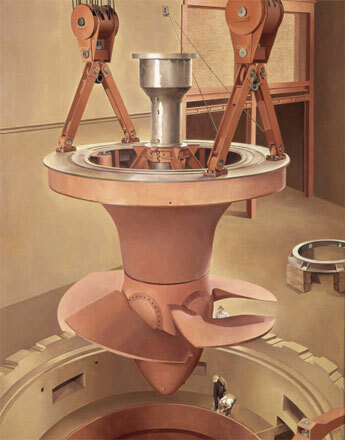 The text of the Power portfolio claimed that Sheeler depicted machines not as “strange, inhuman masses of material, but exquisite manifestations of human reason,” because the machine was to the present what the figure had been to the Renaissance. Steam Turbine, the fifth in the series, was based on one of the turbines at the Hudson Avenue Station of the Brooklyn Edison Company, New York, and then the world’s largest steam power plant. The curving, steam-filled loop dominates the composition; in the foreground are other machines such as heat exchangers, pumps, and automatic valves. Sheeler concentrated on the “geometric perfection and implicit power of the forms” (Lucic 12), as he had done since his first big industrial commission, photographing Henry Ford’s River Rouge Plant outside Detroit, in 1927. 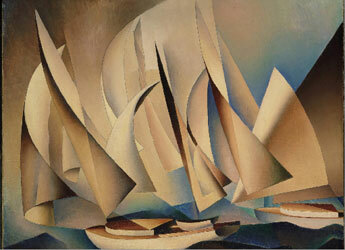 However, in 1912, after studying at the School of Industrial Art and the Pennsylvania Academy of the Fine Arts in Philadelphia, he began to support himself as an architectural photographer in 1928; Sheeler was commissioned to photograph the ocean liner, the US.S. Majestic. 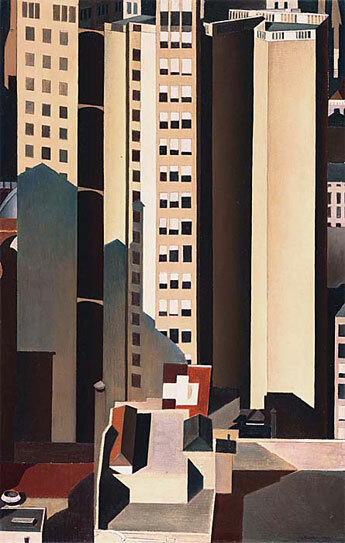 His work, Upper Deck (1929, Harvard University Art Museums, Fogg Art Museum), based on that photograph, was a turning point because, for the first time, Sheeler discovered how to achieve photographic qualities in paint. As he later recalled, “Starting with Upper Deck I have sought to have a complete conception of the picture established in my mind, much as the architect completes his plans before the work of bringing the house into existence begins Sheeler consciously “sought an architectural structure and an impersonal surface, devoid of temperamental slashes of paint or layers suggesting sequences of time” (Lucic 23). He wanted to eliminate “the means to the end, meaning the technique as far as possible and to present the subject in itself without the distraction of the means of achieving it . 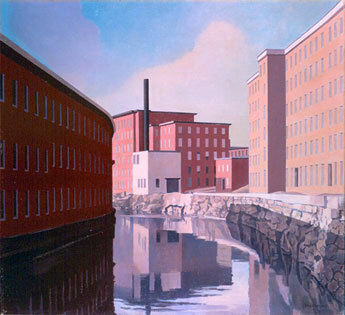 But in Sheeler’s best paintings, the impersonal surface shimmers; it is like a still reflection in a pond, not just a reflection of a single, unified image but an image of concentration. 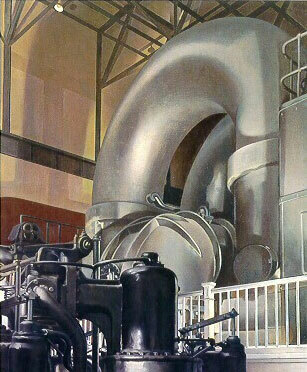 In Steam Turbine, the “precision of the geometric structure, the subtlety of the paint surface, and the nuances of color simultaneously convey both the information of a photograph and the qualities” of a painting (Lucic 12). 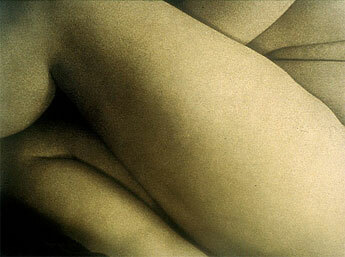 Critics were not always pleased with the obvious relationship between photographs and paintings in Sheeler’s work. 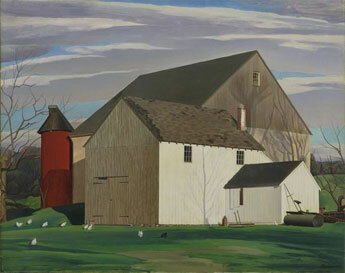 Milton Brown, perhaps his strongest critic, noted in his review of the Power series that the paintings were probably the most photographic of Sheeler’s works, lacking the abstract quality of some of his earlier paintings. Brown found the color “cold and unexpressive.” His criticism was that the paintings failed to capture the “dynamic energy hidden within these engines of power, the potentialities of movement, creation, or destruction.” But in saying that there was “no longer a question of any such principle as the relation of art to nature,” (Lucic 14). 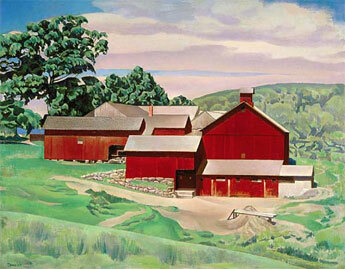 Charles Sheeler died in Dobb’s Ferry, New York, and May 7, 1965.